Includes CD software and dongle. Bring your embroidery and multi-decoration designs to life with EmbroideryStudio e3. 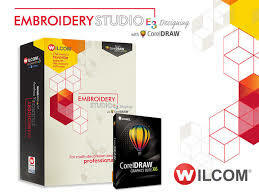 With CorelDRAW® Graphics Suite X6 included, EmbroideryStudio is a design and production system without rival. That's why professional embroiderers and apparel decorators the world over have made it the industry standard for its features, for its simplicity, and for its quality. If you’re serious about embroidery and multi-decoration, EmbroideryStudio e3 Designing is your answer. As Wilcom’s flagship product it provides all the tools a professional embroiderer would need and more. Harness the full power of Wilcom lettering, editing and embroidery digitizing software. Now integrated with CorelDRAW® Graphics Suite X6, EmbroideryStudio e3 Designing is your all-in-one design solution not just for embroidery but DTG, screen print, rhinestones, appliqué and more. hello. quick question what version is. there is 3 version. If the E3 is still available, please call or text me at 281.788.9681.